Improve your cardiovascular endurance, potentially eradicate neck and back pain. Learn the most fundamental exercise of Kettlebell Training, properly. Learn the most important aspects of kettlebell training and lay a foundation for becoming a professional kettlebell trainer. This course includes the most important exercise of kettlebell training – the Double-arm Conventional Kettlebell Swing (AKA Russian Swing). Plus, learn how to transfer your skills and teach others. This course covers every intrinsic detail of the kettlebell swing, explained and broken down in such a way that everyone can understand it; it’s basic but at the same time advanced. Whether you are a personal trainer who wants to fully understand and be able to teach your clients the kettlebell swing step-by-step, or whether you’re a kettlebell enthusiast who is looking to strengthen the back, improve cardio, strengthen the core, improve flexibility or potentially eradicate neck and back pain, this course is for you. Below is the course content, you can sample the lessons that are blue, full access provided after enrolment. This publication is a great asset for fitness enthusiasts. It covers an under-appreciated yet vital element in functional movement, the hip hinge. I’m glad I got the opportunity to help contribute to this important topic. I hope you find it useful and informative and, most importantly, incorporate this valuable information into your fitness routine. 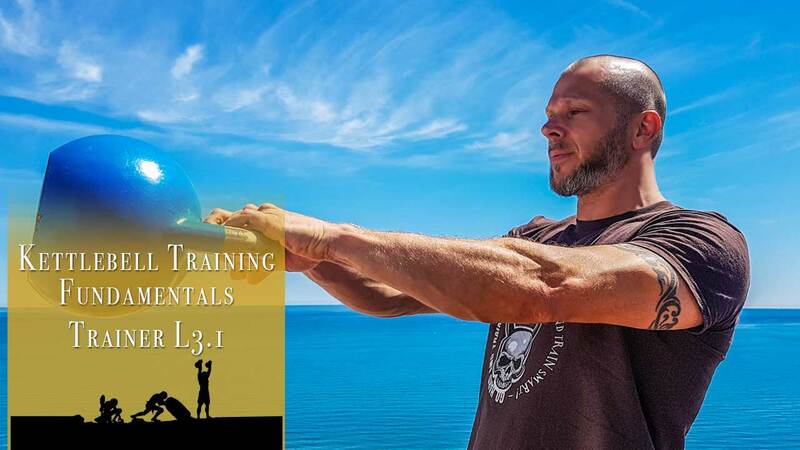 The hip hinge movement alone is covered by more than 18 pages of information, following is the index of the ebook which you’ll receive with the course. 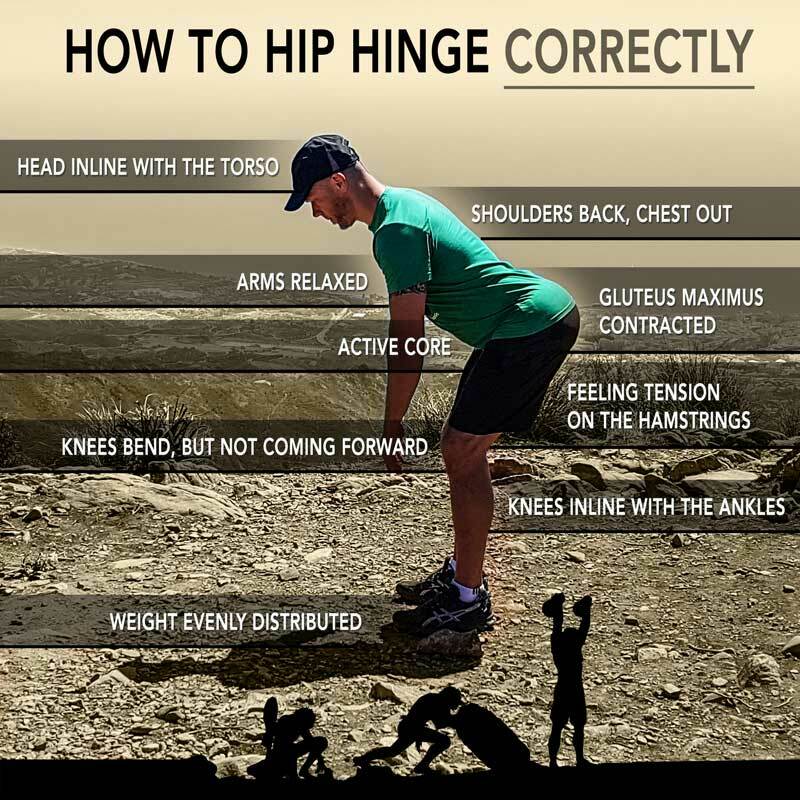 What is the hip hinge? And how to perform it correctly? Know, that just about everything from the hip hinge material transfers to the swing, which is also a hip hinge, but explosive. The hip hinge is the pre-cursor to the kettlebell swing, once you understand the hip hinge you’ll not only be able to perform a perfect kettlebell swing, you’ll also be able to perform better with your conventional deadlift, bent-over row and more importantly with everyday tasks like lifting and reaching for objects. As a Certified Personal Trainer for 14 yrs with an associate degree in Physical Therapy as well, I can say this course would greatly benefit beginners through advanced. 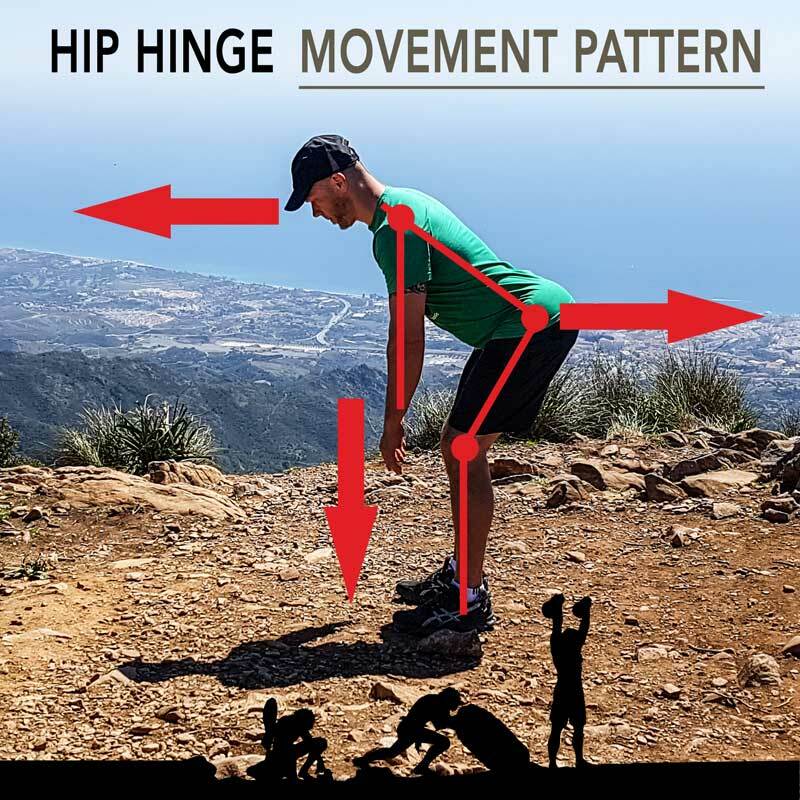 Cavemantraining breaks down in detail the hip hinge which is a crucial movement for proper deadlifts, kettlebell swings and countless other “hip hinge” exercises. In my humble, yet educated and experienced opinion, hip hinging correctly makes your back invincible – but done incorrectly and you are one bad rep away from disaster. This course will definitely help you to hip hinge correctly and to understand more about what is actually going on during hip hinge exercises. The course material includes extremely detailed information on the Conventional Kettlebell Swing (hip hinge), it breaks down the movement step by step, explains the muscles to engage, the reasons, it also covers the most common mistakes and how to fix them. The documentation on the Kettlebell Swing is over 29 pages long, the video of Taco Fleur demonstrating the Kettlebell Swing is over 38 minutes in length containing different angles, slow motion and other details that are required to fully comprehend this vital exercise. There simply is no other online course out there that breaks down the basics of Kettlebell Training and the most important exercise like this one does, if you’re serious about Kettlebell Training and want to correctly learn the fundamentals, then this course is it, it will lay down the foundations for your future progress. Following is the index of the theory that covers the Kettlebell Swing which is provided in ebook, video and audiobook format. Previous owner of 3 kettlebell / functional training gyms in two continents. Has taught kettlebell group and private classes in Australia, Vietnam, Thailand and Spain to hundreds of people. More than 19,000 subscribers and over 300 kettlebell videos on Youtube, and as of this writing has more than 4.5 million views. Previous owner of The TOUGH Spot gyms in Australia and Gym Elite in Vietnam.